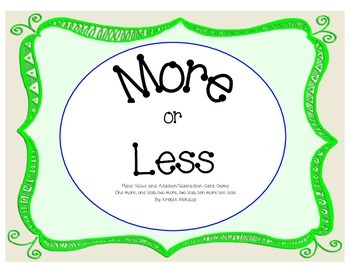 Inside this packet there are two More or Less card games that can be created for two different levels of learning. The easier level uses numbers 0-30. The harder level uses numbers 31-80. Both games have the same rules. This card game is for 2-6 people. Hand out all of the cards equally between the players. Place one card face up in the middle of the table. Each player holds their cards in their hands, or lays them face up on the table. Players will look at the card in the middle of the table. The number inside the circle is the starting number. The numbers in the corners are what can be added to or taken from the starting number. 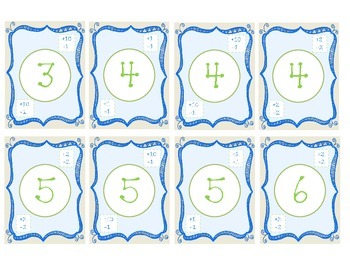 For example: if the starting number is 24 and the corner numbers are +1 -1 then students can add 1 or subtract 1 from 24. 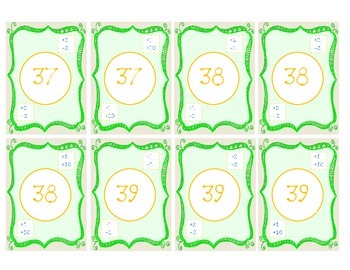 They will look in their hand of cards to see if they have a 23 or a 25 in their circle number. If they have one of these cards they place their card on top of the card in the middle. The first student to place their card gets to leave it there. Then, their circle number becomes the new number to add to or subtract from. The goal of the game is to be the first player to get rid of all of your cards.